The man came through the Family Van’s open door for a blood pressure screening, but Harvard Medical School (HMS) student Melissa Burroughs soon realized something else was wrong. He fell asleep while talking and, when awake, repeatedly switched the conversation to unrelated topics. His mood changed rapidly as well. And when Burroughs checked his eyes, she saw that his pupils were tiny pinpoints and unreactive to light. After learning that the man had a history of drug abuse and psychiatric problems, Burroughs contacted his doctor and then called an ambulance to bring him to the hospital. Family Van Executive Director Jennifer Bennet said the man very likely wouldn’t have received care that day if he hadn’t come to the van. The Family Van’s open door is a welcome sight to those in Boston’s low-income neighborhoods looking for medical care. Clients who step into the van also step past barriers that have often kept them outside the health care system. The van serves 6,000 people each year, Bennet said, including hard-to-reach populations such as urban men. Renata Lewis (right) of Roxbury reacts to the finger prick necessary for a blood sugar test administered by Caroline Ditson, a visiting British doctor who volunteers on the van. The Family Van is a program of Harvard Medical School with the twin missions of reaching out to underserved communities in Boston and providing important experience for medical students. 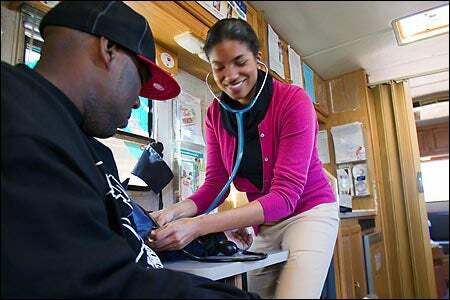 The van, a converted Winnebago, has been visiting sites in Roxbury, Dorchester, and Mattapan since 1992, conducting free screenings for diabetes, pregnancy, AIDS, high blood pressure, glaucoma, and other illnesses. As they help with that work, students report that they get an entirely different view of patients than that available from a hospital ward or emergency room. Harvard Medical School Dean of Students Nancy Oriol said that people who become doctors don’t always know the problems and conditions of those in poor neighborhoods. For those students, the van experience is an eye-opener. Oriol, who started the van in 1992, said it isn’t intended to be a mobile doctor’s office. What people in these underserved communities need, she said, is a connection to the existing health care system, which seems unfriendly to them and within which they are all too often forgotten. The Family Van depends on strong relationships with community health centers and on a large number of community partnerships. The partnerships give workers on the van places to refer clients dealing with different issues. These referrals are critical, according to Bennet, because they bring the patients into the existing health care system. Robert Jones (left), 49, answers questions about his health history before being given a blood pressure test. That early intervention can amount to big savings in health care dollars. An encounter on the van costs as little as $75, while a visit to the emergency room for stroke due to high blood pressure or a coma from untreated diabetes can run $70,000, Bennet said. Perception can be as big a barrier to health care as reality, since people sometimes don’t go to the clinics because they think they can’t afford care, Bennet explained. “You’re removing a barrier, because even though payment is not an issue at a health center, it is perceived to be,” she added. The van visits a handful of sites regularly and constantly keeps an eye out for new locations. One recent Monday, the van was parked in Dudley Square as schools sent a stream of teenagers into the streets. The nearby bus station kept traffic brisk by the van’s doors.